Following the success of our ‘Get a Grip’ on ladder safety campaign last year (where we saw over 6,500 Ladder Safety Packs downloaded from the campaign webpage! ), we are delighted to announce our NEW campaign to kick off 2019…‘A Step Too Far’. 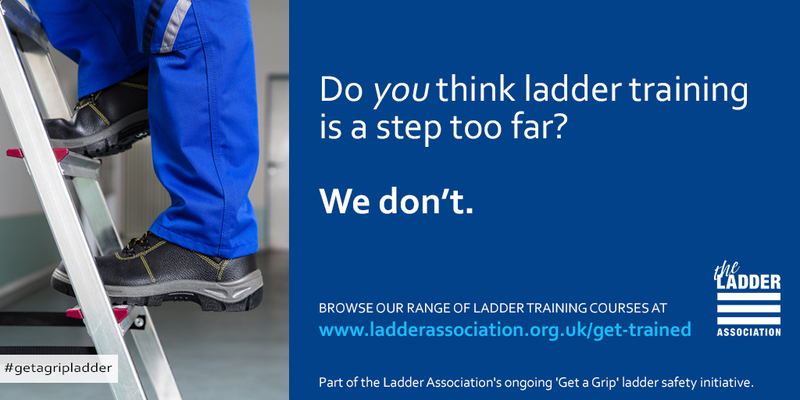 To support the ‘Step Too Far’ campaign, we’ve created a NEW campaign webpage at www.ladderassociation.org.uk/get-trained/. There's also NEW digital assets for you to use on your social media channels - you may have already seen them appearing on our own social media. We’re working hard to spread the ladder safety and training message – but we can’t do it alone. Help us! Attached are the new digital assets you can use. Otherwise, please make sure you're following our Facebook, Twitter and LinkedIn pages and SHARE our posts with your audiences. For more than 70 years LFI has been manufacturing and supplying Trade and Industry with a huge selection of the finest aluminium, steel, timber and GRP ladders, steps and access equipment available. Based in Newent, Gloucestershire, our family business was established in 1947, and since then we have earned our reputation as the UK's leading manufacturer and supplier of the highest quality ladder equipment. We have grown strong by listening to our customers and making sure that our products and services are tailored to put your requirements at the very centre of what we do. We understand your concerns about quality, and all of our products are produced to, and bear, the British Standard kite mark where relevant. We understand your concerns about warranty; all our products carry a minimum 6 month warranty against material or manufacturing defects. We also understand that you sometimes need to talk to someone, and you will find our telephone number prominently displayed on our website. All our sales staff friendly and knowledgeable, and above all you can trust us to handle your order professionally and with the care you the customer deserve. With Systems accredited to ISO 9001:2015, LFI provides consistency in the highest quality products and service, with all products manufactured to BS2037, BSEN131 and BS1129, allowing our customers peace of mind that they conform to the latest work at height regulations. Our Skills and experience combine to make LFI the No.1 choice for ladders, steps, stagings and many more portable ladder types. Someone once said to us “you can judge the worth of a company by how they behave when things go wrong”, and we know just how true this is. Occasionally we might get it wrong but you can depend on us to do everything in our power to sort out problems speedily and efficiently. We want you to shop with us again and recommend us to your friends. It’s pretty basic stuff really. We take your privacy very seriously please see the bellow links relating to the General Data Protection Regulations. Specifications and prices are those ruling at date of printing and may be changed without notice. The ONLY BS EN131 Steel Ladder manufactured and CERTIFIED (3m through to 7m) in the UK.